Historically wildlife trafficking has been a high reward, low risk enterprise for those willing to seek profit in the black market trade of contraband items. Combine limited risk of detection, extremely high profits, and small to non-existent penalties if caught, and not surprisingly, wildlife trafficking becomes a very attractive method of illicit gain. Compared to other transnational criminal activities wildlife trafficking has historically been considered a low priority by many law enforcement agencies. Crimes deemed low priority typically do not receive the same amount of effort in terms of manpower and resources as those viewed as a higher priority. 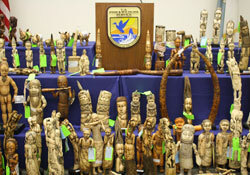 Case in point is the extremely limited or non-existent use of specialized investigative techniques by many countries involved in combating wildlife trafficking.